Amid the ceaseless winter pummeling, no one’s job performance has been evaluated as publicly as the state’s new snow-patrol captains, Governor Charlie Baker and Boston Mayor Martin J. Walsh. Both have seen their own agendas slowed by unprecedented snow and transportation failures. Both have sought to reassure the public through frequent communication about impending storms. And both have seen the peril of such an approach. With each public appearance, the prospects rise for an ill-timed comment that could later prove politically inconvenient; witness the mayor’s about-face Friday on whether the MBTA should shutdown over the weekend. Both men appeared to wave something of a white flag in the face of the wintry onslaught. Two days later, he was back at it, warning of an impending weekend snowstorm. Baker and Walsh have chosen similar public relations strategies, wary that an elected executive appearing unprepared or unsympathetic may be simultaneously signing his career’s death warrant. Both have repeatedly emphasized the “historic” nature of the storms. And both have sought to build their public profile through frequent press conferences, tweeted photos of plows moving snow, and ride-alongs with reporters. The emphasis on appearing lasered-in on the storm is essential, say government veterans. The leadership strategy, though, can also hold danger, as both governor and mayor learned last week. Walsh’s contretemps was the most glaring, after he had to do an about-face on Friday. A day earlier, during a City Hall press conference called to bring attention to another potential blizzard, Walsh said he would recommend that the T close Saturday night — St. Valentine’s Day — into Sunday and perhaps Monday to allow for the rails to be cleared. By 10 a.m. Friday, Walsh’s office had issued a statement “regarding his comments” on Thursday. “Closing the T for the weekend would pose an incredible hardship to workers and people living throughout Boston,” Walsh said. In a separate interview later, Walsh reiterated his concerns that 18 inches of snow could prevent the system from operating safely. Baker’s dilemma was of a different, subtler nature, after he dished the blame Monday to the management at the MBTA, whose rail service had ground to a halt. This appeared to work well until Tuesday, when MBTA general manager Beverly A. Scott delivered a stemwinder of a press conference, handing off responsibility to deeply ingrained systemic woes. Baker’s team publicly backed off the media feud on Tuesday, noting that he had not named Scott, a Patrick administration appointee, directly. After attempting back-channel communications with Scott to let her know he was not seeking to oust her, Baker himself was taken by surprise on Wednesday when Scott abruptly announced she would resign. By Thursday, Baker and Scott were locked in a literal embrace, after a meeting at T headquarters that both sides agreed, in separate statements, had been productive. 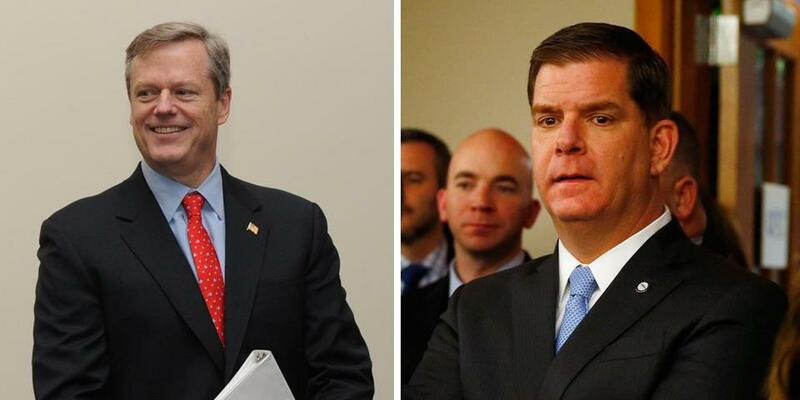 In the meantime, as the region has grown accustomed to seeing their elected leaders in half-zips and snow boots, Baker and Walsh have both watched whatever proactive policy agenda they hoped to steer in early 2015 fall by the wayside. The diabolical weather has pulled Walsh away from championing the bid to bring the Olympics to Boston in the summer — should that season ever occur again — of 2024. Baker has been whipsawed between mending a $768 million budget deficit and coping with storm response. On Friday, the governor said in a phone interview that while the administration was still moving ahead with policy decisions, the storms had imposed some snags. An opioid-addiction working group that he prioritized as an opening salvo of his administration has been appointed, but its announcement postponed two times. As for his job going seemingly endless rounds with Mother Nature, Baker said he would leave any assessment to the voters. “In the end, we’ll make it up to them to decide what’s an acceptable level of performance,” Baker said. Whether Baker and Walsh are judged to have handled the storms well or poorly, both are aware, could have significant implications for both of their young first terms — and how good their chances are for a second. Masiello said that, at bottom, elected officials know that regardless of how high the snow heaps, at some point it could end up on their figurative doorstep.